There was a time when we saw flagship Smartphones are always comes under high range segment but now time changed; lots of flagship Smartphone comes under mid range, the Chinese brands already shows their potential in Smartphone like OnePlus, Xiaomi and now Meizu MX5 in mid range/ budget segment. This handset has key features like Mediatek MT6795 2.2 GHz processor, 5.5 inches display, 20.7 MP primary camera, 4G support, 3 GB RAM, 16/32/64 GB ROM, Dual SIM support and 3150 mAh Battery. 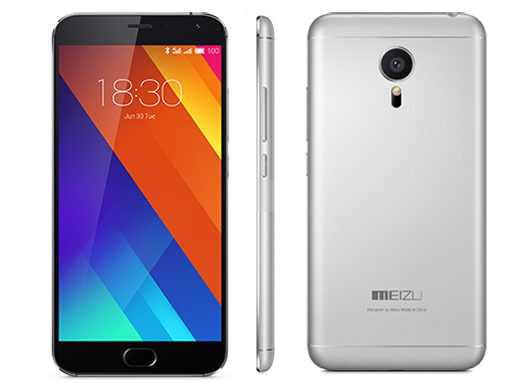 Here we will have Short review, Pros and Cons of Meizu MX5. This Smartphone is delightfully crafted in an all-metal body that isn’t particularly feels slippery and provides a secure grip. After being 5.5 inches phablet it fits in hands easily. The lower button below volume rocker is on the right side and the dual SIM card slot located on the left. The headphone jack is up top, and at the bottom microUSB port, microphone and a single speaker unit. 5.5 inches OLED technology, high-end AMOLED display with Full HD (1080 x 1920p) resolutions and 401 ppi display density is nicely reflects an example of super viewing experience, white-black contrast is quite good. The display doesn’t seem fade in sunlight means sunlight visibility is far better and the OLED display play good role for making better wide angle view. MediaTek Helio X10 Turbo processor with a super clock speed of 2.2 GHz along with 3 GB RAM do a great job. it’s nice to see the FlyMe OS which is optimized in such a way that the Smartphone can work more smoothly. 20.7 MP camera having 6-element lens can capture quite vibrant crystal clear photos. Default camera app is quite simple having control over features likes shutter speed, ISO, exposure, and focus. Other modes include panorama, and Light Field. 3150 mAh battery not impress as other features but it can stand for a whole day. It supports USB OTG Cable. Excellent fingerprint scanner, even better than many high end devices. Speaker has decent audio experience can certainly get very loud. M-Charge, which allow charging the device up to 60% in just 40 minutes. 4K recording available (in 30fps), Slow Motion video capture is also possible at 100 fps. Second SIM slot only provides you with 2G Voice calls. No Expendable memory (micro SD card slot). It is not water resistant like Moto G3. Create a Music folder in the root directory and paste your music there. When we look for new brand first thing comes in our mind is quality of the product where Meizu MX5 is awesome with metallic body, powerful CPU and protective layer for display (Corning Gorilla Glass 3) all in affordable price. And second thing is customer service after sale in this case there are about 40-50 Meizu service centres throughout the India.